A lift kit is a collection of parts that increases the height of a truck, either by raising the suspension or the body itself. They are most commonly sold as an aftermarket product, although some new 4x4s are now sold with a lift kit already installed. A lift kit has a significant effect on the truck’s driving behavior, which the owner should consider carefully before installing. A truck may also require additional modifications to accommodate the increase in vehicle height. Lift kits may be classified into body lifts and suspension lifts, depending on what they lift. A suspension lift generally produces better ground clearance and handling, although it also costs more than a body lift. A suspension lift replaces the shocks and leaf springs for all four wheels, which increases the height of the wheel well. This change allows the wheel wells to accommodate taller tires. Modest suspension lifts raise the suspension by 4 to 6 inches, with the maximum lift being about 18 inches. These extreme suspension lifts are typically used only in competition or by serious hobbyists, since they can drastically reduce the truck’s handling. 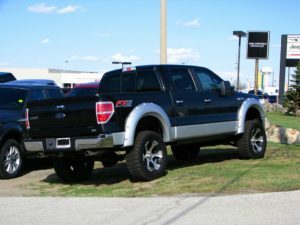 A body lift kit uses blocks or spacers to raise the body of the truck from its frame, usually by no more than three inches. This option is less expensive because it requires far fewer parts than a suspension lift. A body lift may allow the truck to have slightly taller tires since it increases the height of the wheel well, even though it doesn’t increase ground clearance. However, this type of lift kit won’t improve riding characteristics. The most obvious benefits of a lift kit are to increase off-road capability and provide a more comfortable ride. Greater ground clearance allows the truck to negotiate larger rocks and other obstacles that are common when driving off-road. The larger tires and greater suspension also smooth out bumps in a rough road, especially at higher speeds. Truck owners may want a lift kit for cosmetic purposes, due to the change in the truck’s appearance. A truck’s center gravity increases with the height of the lift. The most significant effect of this change is a loss of stability, especially when turning sharply at high speed. This type of driving most often occurs when the driver needs to dodge an obstacle in the road or avoid a stopped vehicle. Drivers must therefore exercise greater caution during high-speed cornering, especially when the lift is greater than six inches. A truck with a lift kit may also tend to lean more during banked turns, which are common on off-ramps and freeway exchanges. A lift kit may require additional modifications depending on its height and the model of the truck. Common modifications include extending the gearshift through the truck floorboard and raising the bumpers. The truck may need to be re-geared to accommodate a change in tire size if the truck is going to have larger tires. Re-gearing may also be necessary to retain the truck’s original mileage. Truck owners should provide a professional truck mechanic with information about the truck model and lift kit to determine if re-gearing will be necessary. Aftermarket lift kits are available from several major manufacturers, although the prices are highly dependent on the type and specific model of lift kit. A full set of four large tires can add significantly to the total cost of installing a lift kit. New tires may not be necessary from a performance standpoint, but stock tires can appear cosmetically unappealing inside high wheel wells. A truck owner with sufficient mechanical proficiency in the right tools can install their own lift kits, although most owners will choose to hire qualified shop mechanic to do so. The best way to ensure that the shop has experienced mechanics and the right auto bays is to use one that specializes in 4x4s. Truck manufacturers in the United States are generally prohibited from voiding a warranty due to the installation of an aftermarket part. However, aftermarket parts are often used as the basis for denying a warranty claim. 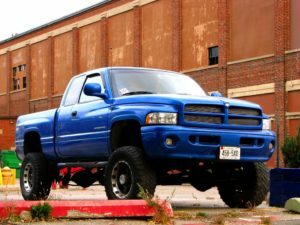 Truck owners should therefore ask the dealership about the effects of installing a lift kit while the truck is under warranty.